UFC recently held its event at the United Kingdom today. 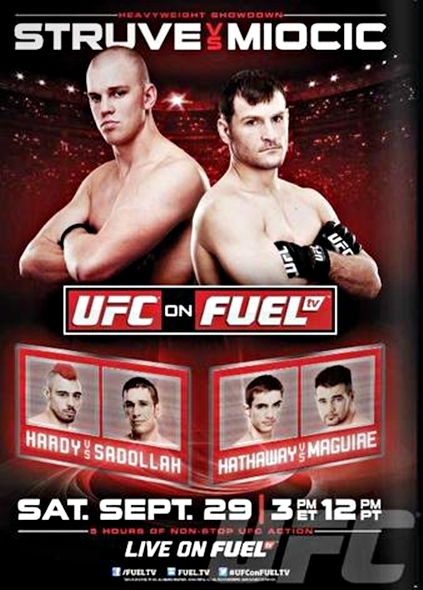 “UFC on FUEL TV: Struve vs. Miocic” event was held at the Capital FM Arena in Nottingham, England. The event featured six bouts at the main card, headlined by a light heavyweight bout between Stefan Struve and Stipe Miocic and 5 bouts at the preliminary card. Struve defeated Miocic via TKO at the second round of their bout, by releasing a series of powerful punches. While co-headliner Amir Sadollah lost to Dan Hardy via a Unanimous Decision with the judges score of 29-28, 29-28, 30-27. The “UFC on FUEL TV: Struve vs. Miocic” event’s main card was aired via FUEL TV at 4pm EST (1pm PST) and the prelims was streamed live through Facebook.com and UFC.com at exactly 1:45 pm EST.